Can you give these dogs a home this Christmas? Bungle, Wallace and Magnus need homes this festive period. 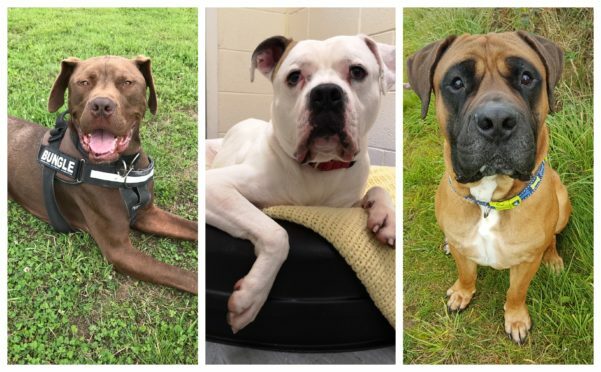 The Scottish SPCA is seeking homes for Magnus, a South African mastiff, Bungle, a French mastiff and Wallace, an American bulldog. Scotland’s Animal Welfare Charity is appealing for experienced big breed owners to give each dog a new start. The dogs are currently in the care of the animal rescue and rehoming centre in Aberdeen where they’ve had a combined stay of 300 days. Graeme Innes, manager of the centre said, “We are really keen to get these big boys rehomed as they are fantastic dogs. “Magnus is the biggest softie and will stick to you like glue at any given chance, the only thing he loves more than people is toys! “Finally, Wallace is a big ball of fun who loves his toys, he has a very loving side and can give a really good hug!